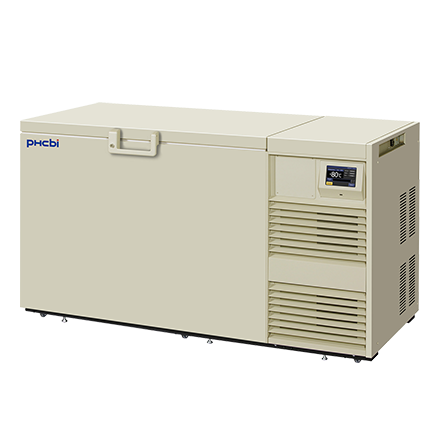 TwinGuard -86˚C MDF-DC500VX chest freezer delivers the unsurpassed level of safety and sample security that is critical for valuable biological samples alongside exceptional ease of use and data monitoring. The Dual Cooling System offers the highest level of protection through the use of two independent refrigeration systems. If one system unexpectedly fails the other can maintain the freezer in the -70˚C range. Securely store valuable and irreplaceable samples with the upmost confidence that they won’t be lost in the case of compressor failure. Significantly extended critical time to react to any sudden mechanical failure. Ideal for high security applications. TwinGuard chest freezers maintain even better temperature stability and uniformity during routine door openings than equivalent upright models as less cold air leaves the freezer while the door is open. Temperature sensitive samples such as therapeutics and biospecimens. Samples needing to retain viability such as stem cells, engineered tissue, organs, vaccines, hybrodmas, cancer cells or fibroblasts. Pathogenic samples within high security laboratories. Ultimate Sample Protection with the extreme secure Dual Cooling System. VIP PLUS provides 30% more storage capacity compared to conventionally insulated freezers of the same footprint. Approximately 15% Energy saving ECO mode operation. Intelligent interface Data log function.